This has to be have been one of my favorite challenges to date. Aquamarine just happens to be one of my favorite stone. It's light blue is the color of the sky as well as the ocean. Andrew of The Writing and Art of Andrew Thornton was extremely generous as always. Along with the strand of aquamarine, he also included a selection of premium Czech glass (both new and vintage), vintage lucite, quartz rock crystal, vintage glass, waxed Irish linen,hand-dyed recycled sari silk ribbon, aquamarine chip strand, vintage Venetian seed beads, and a Luxury Bead Blend. I made up a few designs and have quite a bit left to use in other pieces. 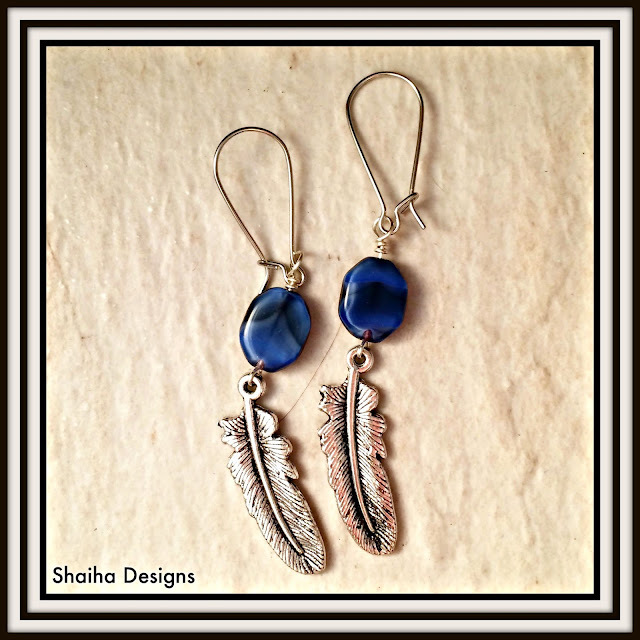 First up are a couple of pair of earrings that I plan on donating to Ears To You. The beads are from this dragon's hoard and I added the charms/dangles from my stash. Next up is a necklace that features the 'mystery component' that Andrew always sends along. This time, it was a beautiful blue focal with puffy clouds. I added some cracked glass along with some beads from the Luxury Bead Blend. 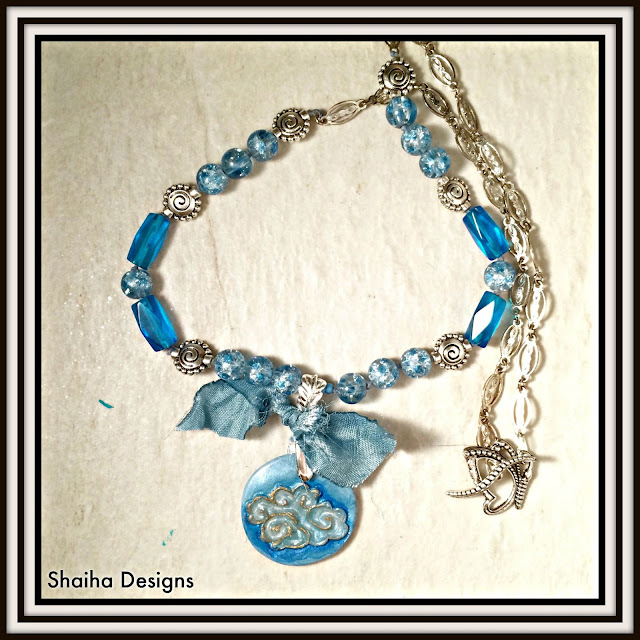 The little butterfly clasp adds summer touch to this necklace. Since I was sold on this challenge by the Aquamarine, I had to design up a necklace celebrating it in some of its various forms. This necklace has Aquamarine nuggets, beads and chips along with one of my hoarded Blu Mudd focals. I finished it off with pewter beads and clasp. Finally it is summer and I have had oceans and the beaches on my mind. 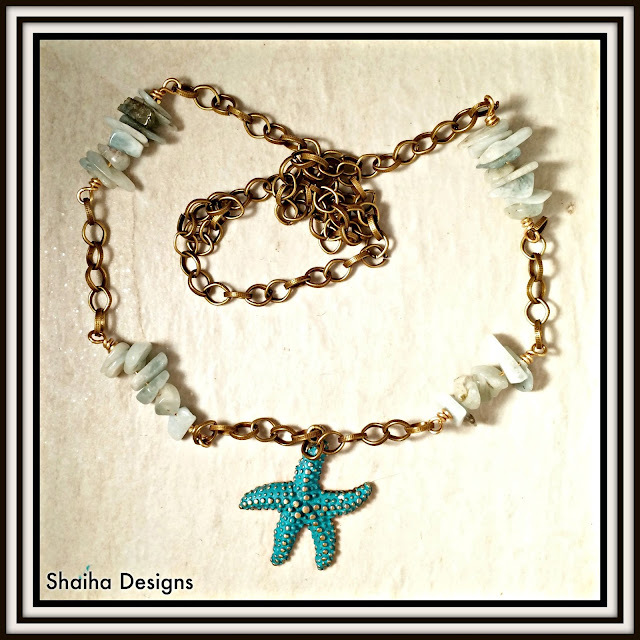 This casual necklace combines aquamarine chips, a brass starfish that I applied patina too and brass chain. It's long enough to just toss on as you head out to enjoy your summer day. All of the necklaces will be part of my August update to Jewelry Because where a portion of the sale is donated to the World Wildlife Fund however if you are interested in one, drop me a line. I am always ready to give my readers a discount before my jewelry hits the website. And yes, I still donate the same amount to WWF. 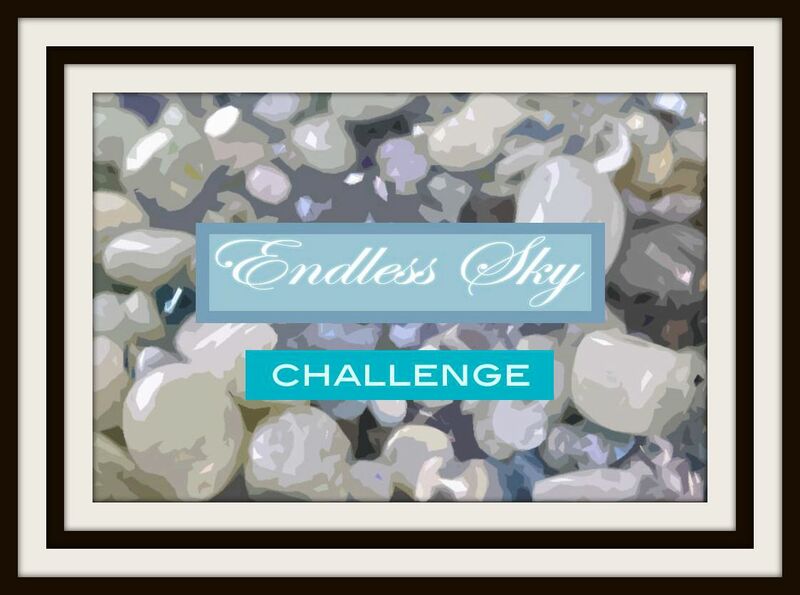 Now this is a challenge and there are a few of us artists participating. We all start out with the same beads and it is a real pleasure to see where everyone's muse takes them. Just click here to get a chance to view some real eye candy. Such a charming collection of creations! It's great that you are donating the proceeds of the pieces to charity! You're a good apple! I love all your pieces, but my favorite is the one with the Blu Mudd focal. I love the blend of organic and smooth and how you've coaxed all different colors from the stones. Such pretty pieces! Thanks so much for participating! I always look forward to seeing what you'll make! Love all of the beautiful designs that you made with the beads. Great job. Ohhh, lovely pieces! I really love the second earrings with the dramatic off white drops! I like the way you put the sweet little piece of sari silk on the mystery component necklace and showed the greener side of aquamarine in the following necklace. I'm charmed by your starfish piece; I love a throw it on and go style! What pretty pieces. I especially love the one with Andrew's surprise focal. It's a real sparkler. 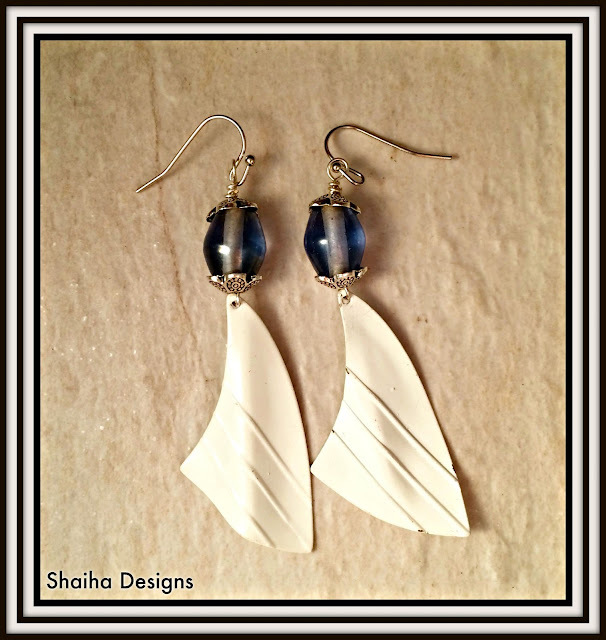 Your designs are all so beautiful and I love the earrings that remind me of sailboat sails. Very pretty! Your necklace designs are all so soothing to look at with all the blue hues and pretty details. The ribbon and butterfly clasp are perfect accents for Andrew's focal bead. 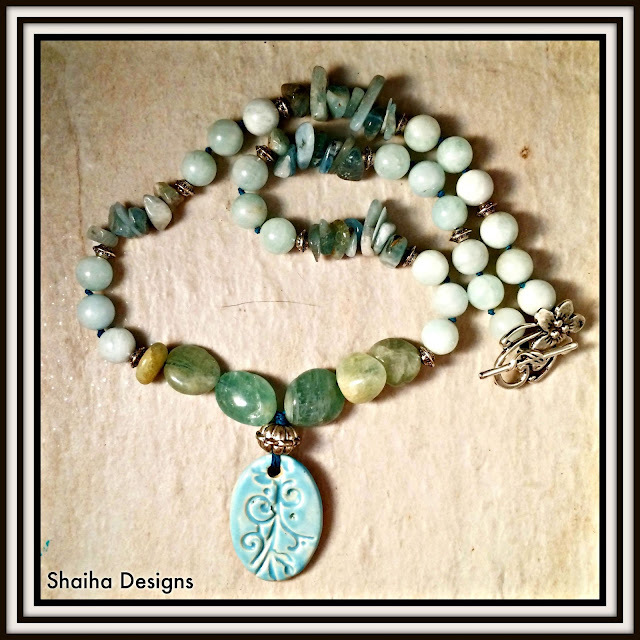 love the chunky greenish-blues of the second necklace with the ceramic bird focal. Very organic. And the ocean-themed necklace is simple yet elegant. Great job!! I love what you did with the chips in the last necklace! I adore the butterfly clasp necklace as well. Stellar work!